After my stay in what is officially an Area of Outstanding Natural Beauty, here’s some beauty of a less conventional kind. I glimpsed it out of the train window, and it stayed in my thoughts, and maybe dreams, for a few days afterwards. Since it’s right by a station I was able to return and photograph it. At this point I wondered whether I should simply leave it there for you to enjoy (or not), but since writing is what this blog is really about, I’m going to go ahead and write about it. What this perfectly exemplifies for me is all those abandoned and forgotten enclaves of wilderness that are constantly close to us, especially in an urban environment. Many of them seem to be created by the presence of railway lines, which carve out little squares and triangles of unusable, inaccessible land which grow weeds and irresistibly attract plastic bottles, tin cans and all the detritus of the surrounding activity. Activity that’s hard to escape from if you need to earn a living, serving a multiplicity of ephemeral but urgent needs. (I’m sounding like an Church of England sermon.) I wanted to say that forgotten outposts like this pictured one, by contrast, lie outside the frantic zone, and just are. This example is just by the main line where hundreds of thousands of commuters pass daily with their laptops, iPads, dry cleaned suits and power hair styles. Some of them, like me, must give it their attention as they stare out of the window. I like the way that it immediately changes the perspective that my mind is locked into much of the time. The effect is like one of those stark portraits of an elderly person on the fringes of life, usually from a third world setting, that you often see in the work of a professional photographer. You are struck by the deep wrinkles, the inscrutable expression and the steady gaze. Here it’s the thoroughly wrecked appearance, as well as the utter unregarded dereliction, that invokes some obscure emotional response. Dirt and decay. How did it come to suffer not only broken windows and a holed roof, but also a total structural dislocation, as if picked up and thrown down by a giant hand? It seems to mock the vertical regularity of the flats visible behind it. Sparkling armada of promises draw near. A huge and birdless silence. 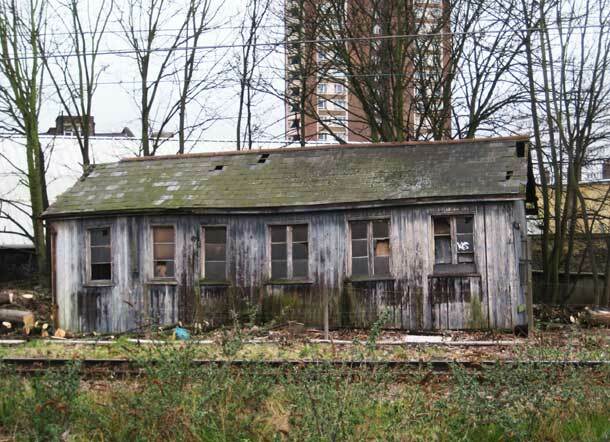 Too much to read into a picture of an old shed? If I have made anyone unnecessarily gloomy I apologise. Perhaps blogs should carry warnings, like films or TV programmes: This post contains thoughts that some readers may find depressing. But I like a good wallow. This entry was posted in Commuting & life in general, What are we, really? and tagged business, Commuting, death, life purpose, Philip Larkin, Train. Bookmark the permalink. Thank you! And writing this prompted me to get hold of a book on this theme by two poets. I meant to buy it when it came out, but never got round to it. It’s ‘Edgelands’ by Michael Symmons Roberts and Paul Farley.